I’ve had Le Mont Saint-Michel, Normandy and Brittany on my mind for several years now. This region is at the top of my travel wishlist and I’m becoming increasingly consumed with thoughts of a nice long stay. I want to drink cider, eat sea salt caramels, stare at the sea, tour Le Mont Saint-Michel and just soak everything in. I don’t know when it will happen, but it will! If you’ve traveled to this area before–I’d love to hear about what you loved! 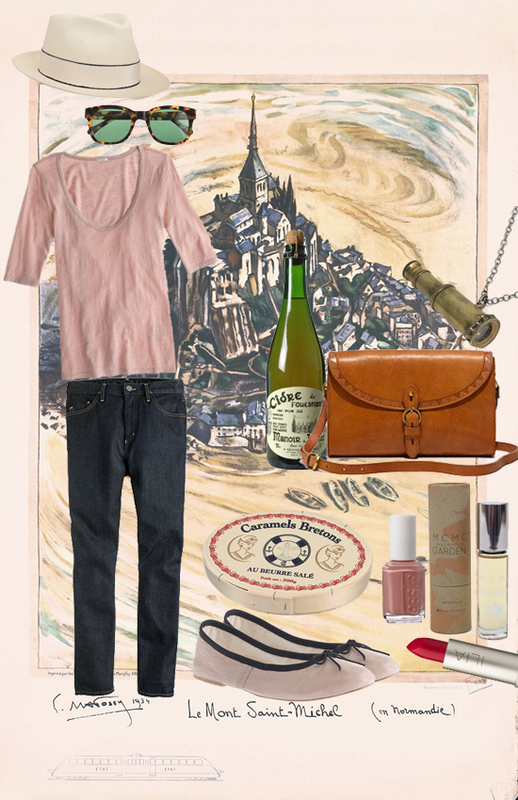 Here’s a little outfit I put together while daydreaming about visiting Le Mont Saint-Michel. I’m sorry that it’s been such a long time since I made a Dream Outfit! Find more HERE. As summer is getting closer I’m looking forward to frequent trips to the amazing Portland Rose Test Garden. We always have a regular stream of visitors during the warm months–flocking to take in the town for the first time or the 12th time. The garden is a place I look forward to taking friends to watch them become completely overwhelmed by the remarkable beauty. Here is a dreamy outfit I put together for a June Rose Garden stroll–maybe on my birthday (it’s coming up on June 26). I already have the locket and cedar rose hair oil (it smells AMAZING)–so, now I just need the rest! That moon ring is making me swoon! I’m such a moonchild and pearls are one of my birthstones, too. Also, that dreamy leather bag would be perfect. Sigh. Here are some pretty things I’ve been admiring lately. The perfume is an old favorite that I’d like to start wearing again and the iPhone case is one I bought recently–it’s great. Have a wonderful weekend! More DREAM OUTFITS. CANDY COATED THINGS: embellished silk dress / sunglasses / striped iPhone case / leather satchel / pastel nail polish set / cloud ballet flat / french vanilla lip balm macaron / turkish delight perfume (LOVE). ♡ ➔ A sweet little shop. ♡ ➔ Stunning vintage photographs! ♡ ➔ I LOVE THIS LOOKBOOK. ♡ ➔ Delicate and utilitarian. A lovely new collection. ♡ ➔ Beautiful. Modern amulets! ♡ ➔ The yummy cocktail that I had in Chicago. ♡ ➔ SO excited about THIS MOVIE! 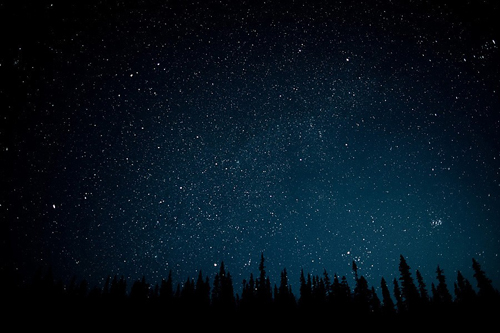 ♡ ➔ A VERY dreamy collaboration. ♡ ➔ An easy way to help recue some sweet animals. ♡ ➔ A darling collection from Australia. ♡ ➔ Super deal. These kitchen linens are stunning. ♡ ➔ BUBBLE GUM, MARINE AND ECRU! Love. ♡ ➔ Lots of fun links, a beautiful cloche and an old-timey pup! 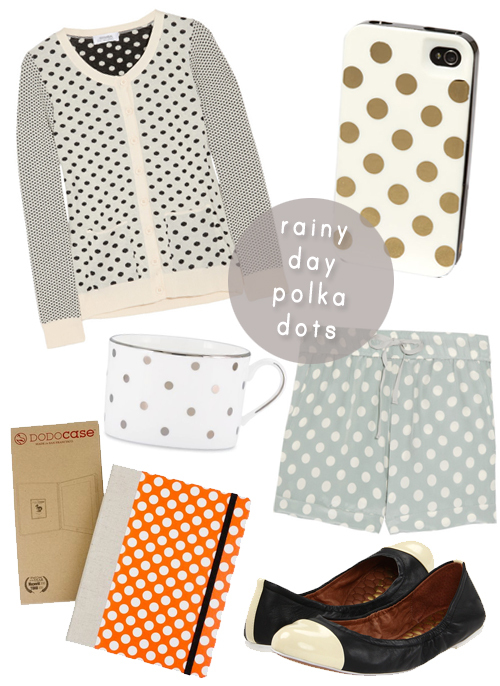 During a torrential downpour on Monday, I put some cute polka dot pieces I’ve been admiring together. Here’s a spotty outfit to lounge around in while you’re waiting for the skies to clear. Polka dots just always seem to make me feel more cheerful! hi there! this is Alyson from Unruly Things. I’m excited to fill in for Jen while she’s off in New York. Jen asked for our guest posts to have something to do with the theme “love” and the first thing that I thought of was taking a romantic, weekend vacation–for two! since my son Wolf was born, my husband and I haven’t had any “us time”. not to say we’re dying to get away from the little guy, but a weekend for just the two of us sounds quite nice! 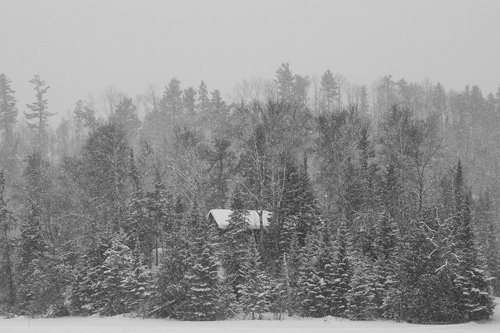 lately my mind has been pretty distracted with the idea of enjoying a wintry weekend getaway to a cabin in the woods. free of distractions, time to unwind and most importantly, exploring the wilderness. we’d explore on snowshoes. we’d play outside in the cold air until our noses and cheeks turned pink. then we’d hunker down in our comfiest sweats in the evening. we’d dream about our future while fixing a delightful dinner. we’d play cards and make up silly songs. 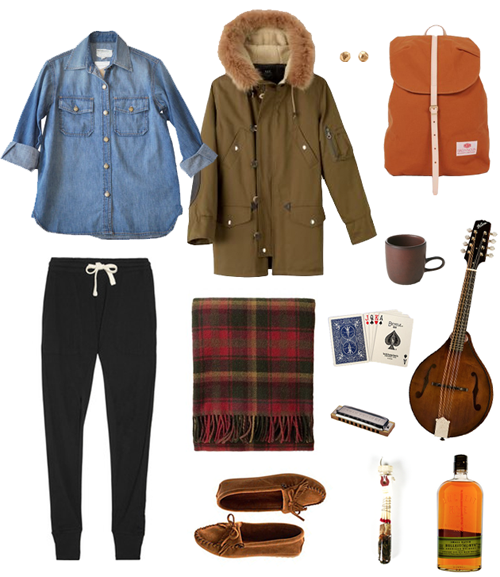 we’d warm our bodies with whiskey by the fire. Thanks, Alyson! Find Alyson at Unruly Things and on Twitter.